Harry Kane says he will step up his recovery from an ankle injury next week and is optimistic of making a prompt return for Tottenham. Kane damaged ligaments in his left ankle during Spurs' defeat against Manchester United last month and has missed the club's last five fixtures in all competitions. The England captain was ruled out by Tottenham until March and was not expected to return to training until early next month, but Kane offered an encouraging update on his ongoing return to fitness. "It's going well. 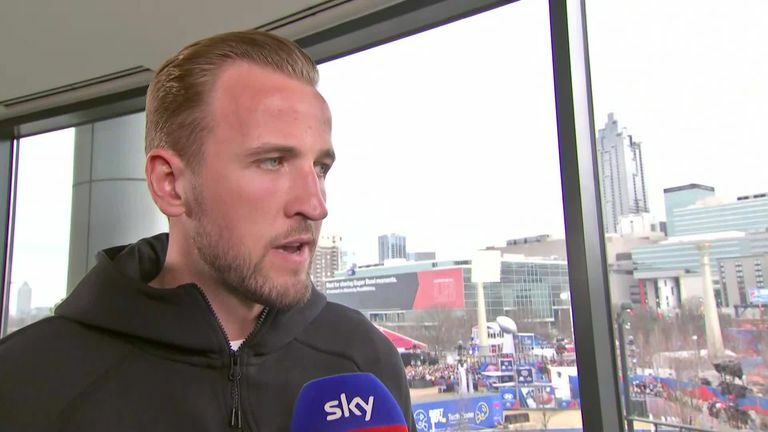 I went away for some warm weather training and we're stepping it up, [we will] see next week how we go, start to get the balls out and just see how the ankle reacts," Kane told Sky Sports News. "It's going well so far but we have just got to take our time with it and make sure we get it right." Tottenham host Borussia Dortmund in the first leg of their Champions League last-16 tie next Wednesday, before pivotal back-to-back league fixtures against Chelsea and Arsenal are followed by the return leg of their match with the Bundesliga side on March 5. Get Sky Sports USA to see Super Bowl LIII this Sunday. Find out more here. Asked whether his rehabilitation was ahead of schedule, Kane, who is attending Super Bowl LIII in Atlanta, added: "I never put a time on any of my injuries. "It is just about how it feels. The ankle feels great at the moment, so as long as the swelling stays away and we can keep progressing that would be great." It's been nerve-wracking watching them but a couple of great wins. Tottenham have won all three of their league matches in the absence of Kane, but were knocked out of both domestic cup competitions in the space of four days, and the striker admits he has found it hard to follow their fortunes from the sidelines. "I have been watching the last couple of games [Watford and Newcastle]. It's been nerve-wracking watching them but a couple of great wins," he said. What if Spurs pushed harder on transfers? "Obviously, I want to be there helping my team but you have got to have a positive mindset. I am just trying to stay as positive as possible. Hopefully I will be back as soon as possible." For 90 minutes of Super Bowl LIII build-up from Mercedes-Benz Stadium in Atlanta with Rob Ryan and Bucky Brooks, join us on Sky Sports USA, Main Event and Mix from 10pm on Sunday, February 3.